UFC middleweight newcomer Israel Adesanya has put the rest of the 185-pounds division on notice. 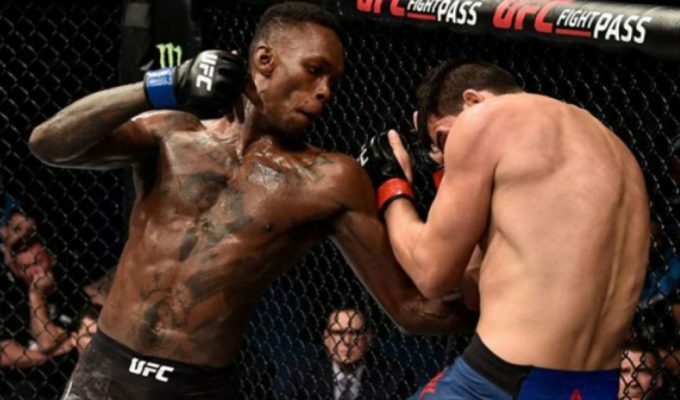 Israel Adesanya burst onto the UFC scene last month with an impressive win in his promotional debut at UFC 221. Adesanya’s two round destruction of Rob Wilkinson put the rest of 185-pounds division on notice and he’s already got his second fight lined up in April against Marvin Vettori. Speaking to MMANytt this past week, Adesanya made it clear that it’s the rest of the division that need to be wary of him and that he’s already seen plenty of evidence to suggest they are. “I don’t see threats, I just see challenges and I always overcome them,” Adesanya said. “They’re all human. Being in the midst of it now, these guys have seen me around and they look at me as a threat. They see my work and I’ve called a lot of them out after the fight. These guys are snooping on my Instagram, peeking in my stories and some of them even accidently like things. They know. Whilst his next fight takes places in Glendale, Arizona, Adesanya is slowly but surely making his way towards a big fight night in Las Vegas. Whilst happy to admit it’s certainly a goal of his, Adesanya made a point of saying that he’s not one to go chasing money and that the reward of not having to work a mundane 9-5 job is enough of a return for doing what he loves the most. “I’m going to f***ing run Vegas,” Adesanya said. “McGregor and Mayweather run it right now, but those number will be mine soon. I don’t chase money or numbers, they chase me. I keep the same energy and I stay who I am. I’m not trying to be anyone else and I’m having fun with this s***. Adesanya’s next fight will feature on a fight card headlined by Dustin Poirier taking on Justin Gaethje at UFC Fight Night Glendale.